HESTA is an industry super fund for health and community services workers. It manages about $32 billion in assets for approximately 800,000 members across the country. 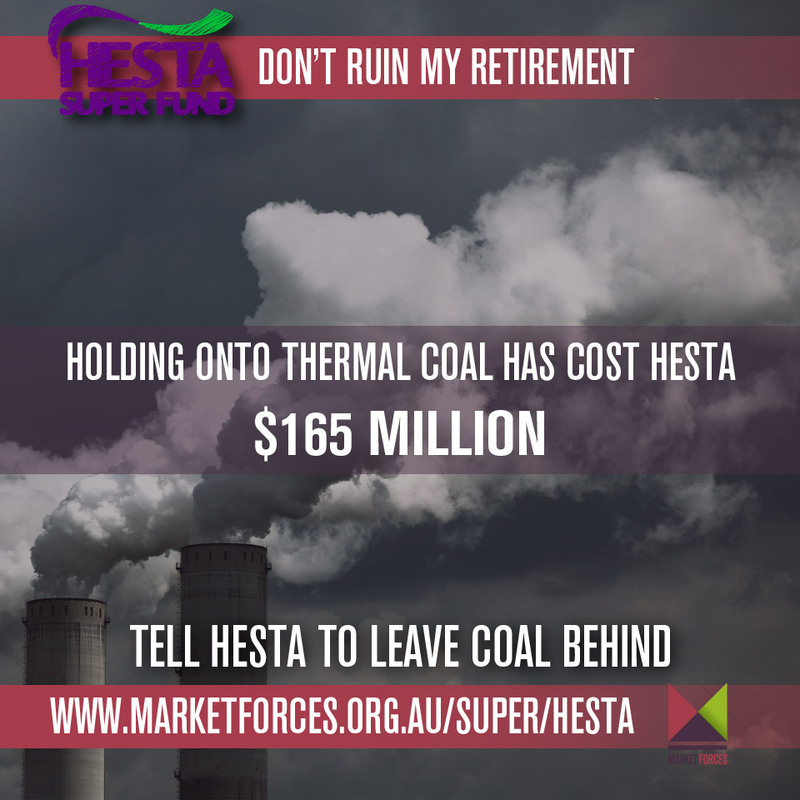 In September 2014, HESTA made a welcome announcement restricting future thermal coal investments across its portfolios. 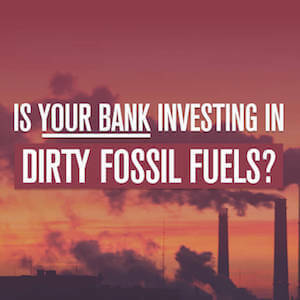 But their divestment action was limited to just a fraction of their funds under management, and we have been able to estimate that not divesting from coal has cost HESTA around $165 million in the year to 30 September 2015. How did this translate into policy? In their largest investment option, the Core Pool (which is also their MySuper default option), HESTA said they would not make any new investments in companies that derive more than 15% of their revenue or net asset value from thermal coal, including exploration, production and transportation. In other words, the restriction only applied to new investments – all existing thermal coal investments would remain. From their sustainable investment option, the Eco Pool, HESTA committed to divesting from existing thermal coal assets as well as restricting any new investments. This extended to companies generating electricity from brown coal. So how have the different options fared? We’ve gone through the interesting (although painstaking) hypothetical exercise of examining the different impacts each option’s coal policy has had over the past year. This isn’t as easy as it sounds, check out the methodology section below to find out how we arrived at our findings. The results are staggering. 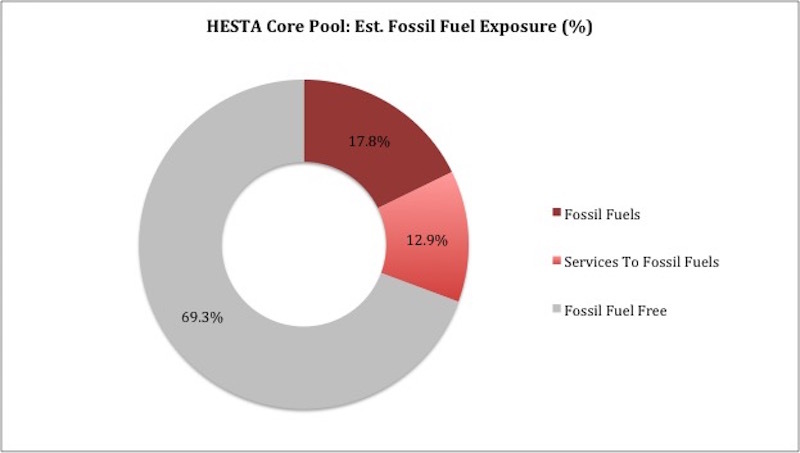 At the time of last year’s announcement, HESTA’s fossil fuel exposure was nearly 18% of their entire portfolio. This compares to the measly 3.3% that was publicly disclosed to members. In short, because HESTA hung on to coal assets in its biggest portfolio, we estimate the fund lost in excess of $165 million in the calendar year to 30 September 2015. This is without including the huge losses on BHP Billiton in the wake of the Samarco disaster in Brazil. HESTA provided decent returns to their members in the period we analysed. The Core Pool returned 10.03% in the year to 30 June 2015, and the Eco Pool 14.11%. However, the Core Pool return would have been substantially improved by the exclusion of coal exposed companies. We acknowledge HESTA was making the right noises when it declared a year ago that it was divesting from fossil fuel investments. But this case study highlights why superannuation members need to demand more than the right rhetoric from their funds – they need to demand intellectual consistency and transparency. Of course life would become infinitely easier for super fund members and Trustees if the industry were given clear guidelines on this long-term issue. As energy stocks have continued to fall in value over the last year, it is clear HESTA made the wrong call in not divesting coal from its entire portfolio, not just the Eco Pool. HESTA only discloses the top 20 share holdings in its Australian and international equity allocations, which add up to just 27.7% of the entire portfolio! Unfortunately, there is no legal requirement for super funds to disclose holdings to members, but despite industry lobbying against the proposed legislation, it is coming. So what do we do about the undisclosed 72%? Like all funds, HESTA uses benchmarks to measure its performance. For Australian shares, it is the ASX300 index; for international shares, it is the MSCI All Countries World ex Australia index. Using these indexes we can estimate what HESTA’s fossil exposures would be for those asset classes where we think it’s significant. For this exercise, we have assumed the fossil fuel exposure in Cash, Property and Fixed Income is zero (even though we know it simply could not be zero in any diversified bond index).